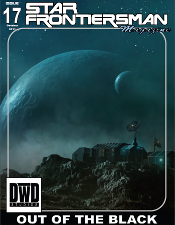 Upcoming in Issue 18 we’ll learn about the Real Truth about the sathar from a TSR designer! Next year is the 30th Anniversary of Star Frontiers. Several Frontiersmen have been meeting in Sector 6 hidden caches all over the Frontier planning several events. Rumors are their will be not one but two full adventure modules and a virtual con. I hope you are excited as I am.